¡Adios, Andy! : What Part of "NO" Don't You Understand? As reported here yesterday, NUHW won recognition for 350 workers at four North American Healthcare facilities in Northern California. Our friends at the Purple Plague could have let this one go, seeing as how there was an absolute majority of workers signing up and asking the employer to recognize NUHW as their bargaining agent. "This is not a done deal," SEIU spokeswoman Michelle Ringuette said. She said the SEIU on Tuesday filed an unfair labor practices charge with the National Labor Relations Board, accusing North American Healthcare of "illegally recognizing" the National Union of Healthcare Workers. She said former United Healthcare Workers leaders purposely allowed contracts with employers to expire at North American Healthcare and many other facilities so that if the SEIU took over the local -- as it did in January -- they would be able to make a play for the workers through a new union. SEIU is now going to go to court in order to try to prove constructive indifference against its former UHW officials - while evidently also trying to duck the fact that SEIU has had "monitors" in place at all UHW facilities since the beginning of the Marshall trial in September, and have been telling everyone far and wide that the only reason people sign on with SEIU is because of the vaunted International bargaining team, and that the locals have little, if anything, to do with it. But arguing the above sets aside the obvious question: Why does SEIU have to resort to raiding in order to bolster its membership - and why does SEIU have to resort to lawsuits in order to retain its membership? Can you explain more about the court case and what this so called "constructive indifference" would mean if it was proven in court by SEIU? Of course we all know that SEIU has been anything but "indifferent" but some more details about this court action would be very helpful. Thank you. keep up the great blogging work! The battle between the Purple Plague and NUHW is taking place on several fronts. The main lawsuit is taking place at the US District Court (Northern District of CA) in San Francisco. Unfortunately, not living in that jurisdiction, I have yet to be able to find any copies of the pleadings that have been filed. First off - remember, I am not a lawyer. I live in the real world. When I refer to "constructive indifference," what I am stating is that, since SEIU will be the moving party, the onus is on SEIU to "prove" that the prior leadership of UHW (Roselli and Borsos et al) intentionally let contracts lapse. However, none of this has taken place in a vacuum. It is entirely possible that an entity like North American Healthcare would prefer to deal with a "local" entity for their union bargaining. Remember - SEIU International has been a presence at the two SEIU HQ buildings (and most of the outlying offices) since the beginning of the Marshall trial, functioning as "monitors." Thus, anything that happened in the time between the start of the Marshall trial in September of 2008 and when SEIU took UHW over in January of 2009; SEIU can't realistically claim that they "didn't know" what was going on in an organization over which they have effectively had their thumb since last September. I am hoping to very soon receive copies of the pleadings in the various cases - eventually they will have to be made public record - and hopefully by then some of the legal issues will become more clear. FYI: In the US District Court for the Northern District of California, in which the SEIU lawsuit against the leaders of NUHW was filed, pleadings are filed online ("e-filing") and are public as soon as they are filed. Since you apparently are familiar with use of the Internets, go to the court's website and look for the link to the electronic filing system ("ECF") and PACER, which is the system for retrieving documents. You have to register for PACER, and then you can download any documents you like for a per-page price. BTW, while you are there, you might want to look at other suits that have been filed over the past ten years against Rosselli (which actually has two "s"s but is often misspelled as "Roselli", with one "s" the way you do) and Borsos. They are not exactly the candidates for beatification that you seem to think they are. Anon@2:39 pm - I am familiar with the PACER system, but it is not a system that is either easy to initially gain access to, nor is it very user-friendly for this venue. Besides, in this lawsuit, we are probably still in the initial pleadings, in which the initial complaint is filed, and the answer (if yet filed) goes pretty much along the lines of the opening statement that Vinny Gambini made in his opening statement in the movie "My Cousin Vinny." As to whether Sal RoSSelli and John Borsos are angels or not - I have yet to make any case for beatification on either of the two gentlemen. However, when stood next to Andy Stern, Eliseo Medina and Dave Regan - and the company that those three scumbags keep - it is apparent to me that RoSSelli and Borsos are saints in comparison. Let's be clear here - RoSSelli and Borsos are through-and-through union guys. However, they are OUR union guys, known by us, trusted by us, and accountable to us. Stern is not, Regan is not, Medina is not. 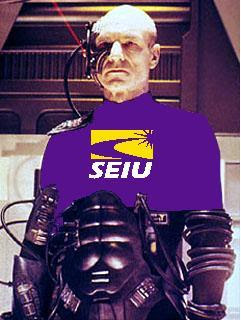 SEIU 1021: "Nothing to see here, move along..."
SEIU - Looking Out for the Common Worker?